Microskiff are neither fast nor seaworthy, or at least this was the common perception of these small skiffs, until now. But Wavewalk’s S4 has recently begun to show that it can push the microskiff’s performance envelope in terms of speed and seaworthiness. The S4 features a twin hull (full fledged catamaran hull) and a personal watercraft (PWC) saddle-seat, so it is constrained neither by the mono-hull form, which is inherently unstable, nor by the ergonomics of small skiffs’ seats that limit the users’ ability to balance themselves effectively. The S4 also lighter than other microskiffs (98 lbs without a motor), and this is a good thing when speed is concerned. The following two movies were shot in Key Largo, in southern Florida. They feature the Wavewalk S4 outfitted with a 9.8 HP Tohatsu outboard, which is a powerful motor for this class of small watercraft. Interestingly, the S4 is officially designated as a kayak, so the fact that it clocked 17 mph makes it the world’s fastest motor kayak. It showed that a microskiff can be effectively paddled, and that the slogan “Forget about paddling” belongs in the dustbin of history. After all, when it comes to skinny water, paddling can be key, and even critically important, and the same is true for weedy water. 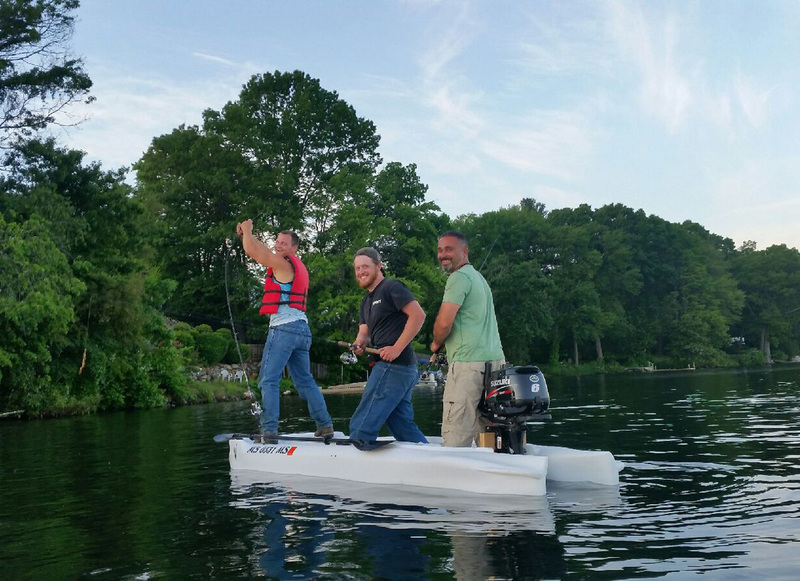 The S4 also proved that a microskiff can be easily car-topped by one person, and its users can be freed from having to transport it on a trailer and launch it only at boat ramps. And now, the S4 has pushed the microskiff envelope again, by displaying top performance in rough water, waves, offshore, and on flat water. 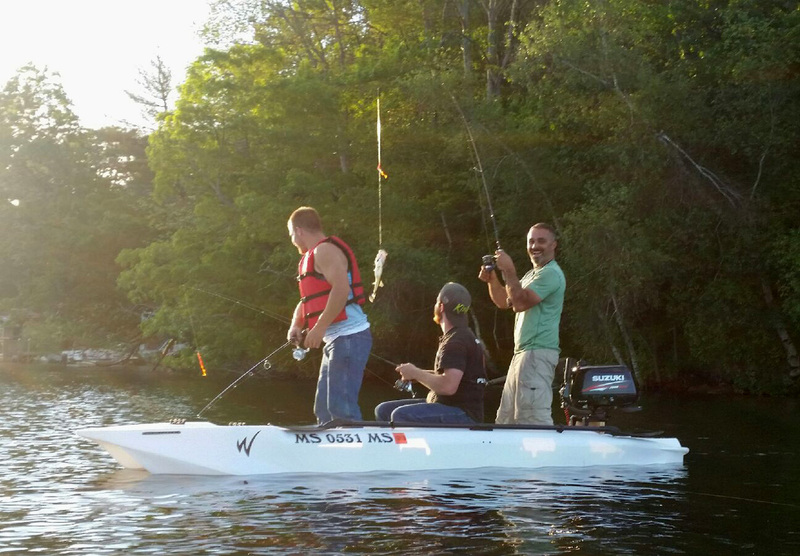 In sum, these are good times for anglers who are looking for a lightweight, portable boat that would effectively replace both a fishing kayak and a skiff, Jon boat, and dinghy, for flats fishing as well as offshore fishing. Many people who own full size skiffs are acutely aware of the problems that come with such a boat, among which are the large footprint when stored on your property, maintenance (time and money), transportation by trailer, and being restricted to launching and beaching at crowded boat ramps (time and aggravation). The maintenance problem is more acute for boats that stay in the water for a long time. 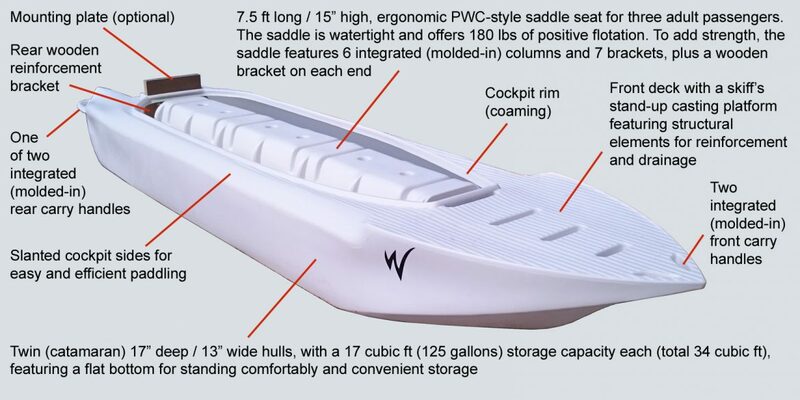 Others are aware of actual shortcomings in performance that large size skiffs come with, namely poor stability in choppy seas, insufficient seaworthiness, and too much draft. The first issue, namely stability and seaworthiness, turn driving a large size skiff in the ocean, or fishing for from it, into a problem, or simply an unpleasant experience – Passengers on board have to pay too much attention to their own stability, due to the action of waves, and as a result of the impact of wakes from fast motorboats passing nearby. Lackluster stability and low seaworthiness can reduce the fun of driving a large size skiff in the ocean, as well as the pleasure of fishing from it. The second problem, which is excessive draft, is equally annoying – Typically, a large size skiff drafts more than a foot, because actual draft is measured at the lower tip of the motor’s skeg, and not at the lowest point of the hull. Such draft may not seem like a noteworthy problem unless you like to fish in shallow water, and it becomes more acute at low tides, when lack of proper planning or simply bad luck could result in your skiff being stranded for hours, with no means to move it due to its size and weight, which prevent dragging and paddling. This is to say that shallow water fishing requires a lightweight boat with a very shallow draft, and large size skiffs are too heavy, and they draft too much to be considered as optimal for it. 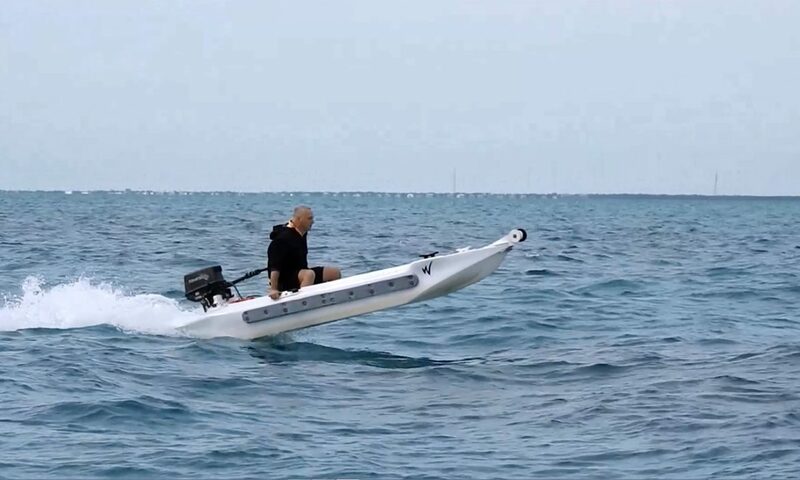 There aren’t that many good substitutes to big skiffs, and not any micro skiff or portable boat can provide a solution without imposing other problems on their owner. Generally, portable boats are even less stable and seaworthy than bigger ones, and some craft such as a motorized board designed for a solitary user are not seaworthy at all, while being too heavy to car top. 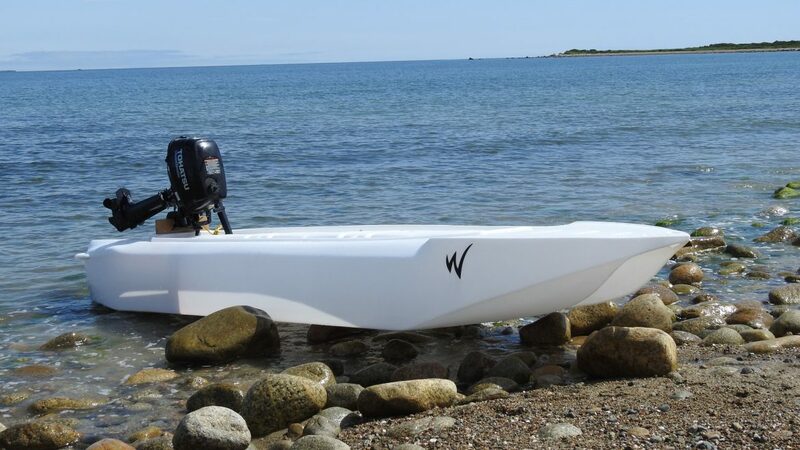 Wavewalk’s new Series 4 (S4) can serve as a good substitute for a full size skiff, since although it can carry on board up to three anglers and their fishing gear, it is still lightweight enough to be car-topped by one person. The twin-hull of the S4 combined with its personal watercraft style saddle seat offer better stability and means for the passengers to balance themselves than most skiffs do, which makes this small boat highly seaworthy where bigger skiffs feel uncomfortable and even unsafe. The S4 can be launched from practically anywhere, and it can take a powerful 6 HP motor that makes it go at a good speed.